“I have lost my new blue socks. Did I put them in my box?” Simple rhymes—including socks, box, fox, and ox!—spin the tale of a small duck who waddles through the countryside, forlornly searching for his blue socks. “I’m trying not to be depressed. / Without my socks I feel undressed.” Finally, a sharp-eyed peacock sees a bit of blue peeking out of duck’s lace-up shoes and the mini-mystery is solved! Soft-hued, adorable pen-and-ink and watercolor paintings adorn this winsome story that shares the familiar experience of not really losing something after all. "A great addition to the literature on ducks. . . or socks!" "Bunting and Ruzzier create a lightly surreal and emotionally benevloent landscape. . . . The book's gentle takeaway [is] reinforced by Ruzzier's signature offbeat aesthetic . . . and Bunting's solid, conversational rhymes." 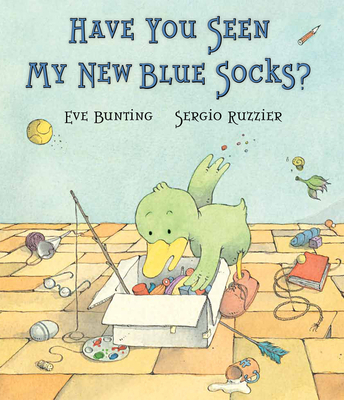 "Such angst over a pair of socks has never been conveyed so well. . . . A perfect book for the newest reader, especially one with a grand sense of humor." "This is a whimsical delight for children whose parents clamor for phonics-based books." "The sonorous, Seussian cadence of Bunting's rhyming text lends itself to reading aloud, but older beginning readers up to a few challenging vocabulary words might also successfully tackle this on their own, especially once they've heard it read a few times."